I never thought much one way or another about the designer Halston, until I started researching him for a mystery novel. I’d remembered Halston’s dresses as tubes hanging on 28AA women with glossy lipstick who partied at Studio 54 in the late 1970s. Then I learned that those simple tubes were masterpieces of Halston’s “spiral cut,” in which he took an extra wide length of fabric — so wide he first used upholstery fabric, then commissioned his own fabric runs in Italy — and fashioned them meticulously to hang on the bias with a long, spiral seam. In the late 1960s, he even worked with legendary couturier Charles James and hung his fabric diagonally to relax before cutting it, just as Vionnet did. Halston’s monastic simplicity? Genius and craft are what made those dresses look so effortless. The best light chypres of the 1970s stir the same magic for me.1 It’s easy to dismiss them as pleasant, but not serious, wafts of oakmoss and green or citrus or vague florals — the gimlets of the perfume world. But like Halston’s spiral cut dresses, when you start to examine them, their complexity might astonish you. Lubin L de Lubin is a good example. Perfumer Lucien Ferrero created L de Lubin, which launched in 1974 and was eventually discontinued. 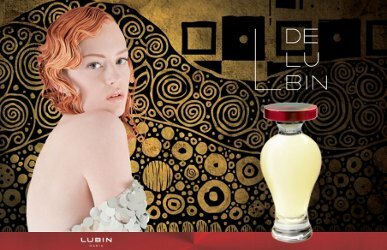 In 2008, the newly revitalized Lubin hired Ferrero to adapt L de Lubin to modern materials restrictions, and relaunched the fragrance in 2008. L de Lubin’s notes include Sicilian lemon, Calabrian bergamot, gardenia, black pepper, ylang ylang, Egyptian jasmine, May rose, iris, lily, cloves, tonka bean, rosewood, patchouli, Mysore sandalwood, heliotrope, vanilla and musk. L de Lubin smells like a warmer, gentler Christian Dior Diorella, or maybe the love child of Jean Patou Que Sais-Je and Molyneux Quartz. It goes on with nose-tingling aldehydes and bergamot, then a vivid cloud of lemon, accented with pepper and what smells to me like mint. And it’s definitely a chypre. Oakmoss lovers, never fear. The new L de Lubin smells as rich and deliciously fusty as any old school chypre out there. L de Lubin’s bright floral heart is well balanced by its citrus, and the whole works plays quietly, with one foot in classical perfumery and the other tapping to Boogie Woogie Dancing Shoes. Yes, L de Lubin is dated. You’re not going to find anything like it on department store shelves. It embodies Halston’s combination of 1970s disco child and eternal goddess. And you know what? I love it. It’s sophisticated and easygoing, and not everyone’s going to get it. But I do. As L de Lubin dries down, its sweet and spicy characteristics emerge. Until now, the fragrance has been green and citrusy with a light, cool feel. Now, the temperature shifts, and sweet wood, a touch of vanilla, and spice complement the moss, which bridges cool and warm fragrance notes so well. Because I’m the luckiest person in the world, I received a nearly full bottle of vintage L de Lubin from a woman who purchased it in the 1970s. Sampling a 40-year-old fragrance is not the same as smelling it 40 years ago, but I wore it next to the modern version of L de Lubin, and I was impressed by how faithfully the new version reproduces the original. Both versions embrace the signature of crisp lemon and white flowers and moss with a hint of vanilla and wood. My vintage version’s top notes are slightly oxidized, but within a few minutes, its jet set heart emerges, fluffed with moss. Here’s where it diverges from the new version. Although the new L de Lubin smells definitely chypre to me, its texture isn’t as mohair-like as the ultra oakmossy original is. Also — and this might be a benefit — the new version doesn’t have the slightly skunky smell oakmoss can give. Finally, the new L de Lubin actually lasts longer on my skin — close to all day, although quietly. Its dry down is also a hint spicier with clove and sweeter with vanilla than the dry down from my vintage bottle. L de Lubin isn’t for everyone. While it's fresh and easy, it doesn't pander. If you like Diorella, but find it a little too freaky to wear every day, try this one. And if you’re ready to look past Halston’s society page spreads of Liza and Bianca to the the intricacies of the spiral cut, you just might appreciate it, too. L de Lubin Eau de Parfum is $150 for 100 ml. For information on where to buy it, see Lubin under Perfume Houses. 1. Other 1970s chypres worth checking out are Yves Saint Laurent Rive Gauche (vintage, if you can get it), Paco Rabanne Calandre, Yves Saint Laurent Y (okay, it came out in the 1960s, but it presaged this era), Givenchy III, Halston (again, try for the older stuff) and Mystère de Rochas. Oh how I love your reviews Angela. The beginning of each reads just like a thriller novel. I’m still partial to Mystere but I will definitely check new L de Lubin out next time I’m in Paris. Thank you! I’m glad you enjoyed the review. I adore Mystere, no doubt about it, and L de Lubin is a nice complement to it. This sounds very appealing (a green, truly oakmossy chypre is always interesting) and your review was a pleasure to read, Angela! I hope you get the chance to try the fragrance sometime! I sampled it by chance, then dug out my vintage bottle and spent some quality time with both. I loved Mystere…it has been very long since I’ve smelled it but can still visualize it. All this talk of Mystere makes me want to put some on now! I already have a solid layer of Timbuktu going, though. Hah, it’s hard to layer Timbuktu! So true! Plus, it lasts all day. I also like Mystere very much, Filomena. I never wore it back in the day, but managed to find a bottle around 2010. I should get that out for early spring. That settles it. I’m definitely wearing Mystere tomorrow. I didn’t know this existed, I would love it. In the 70s, I went through a bottle – canister?- of Rive Gauche, and wore Halston for awhile. In the early 80s I found a Halston slouchy leather jacket and skinny pants in electric blue leather at a thrift store. Both pieces were cut so brilliantly; the collarless jacket had slash pockets and a big brass zipper, mercifully no shoulder pads, and I wore it till it fell apart. Harder to pull off blue leather skinny pants past your twenties but man, I looked good in those pants. Le sigh. Thanks for prompting some good thoughts, memory lane from that era is lined with oakmoss. Wow, I love the vision of your blue leather jacket and pants! Amazing. I so wish I had a photo to gaze at. I have a sample of akkad-it skewed to masculine on me. These notes sound right up my alley-I love retro. Is it wrong that I just want the bottle..would look nice on a boudoir. Thanks for your review Angela..I adore your style of writing. I love the bottle, too! I has a nicely voluptuous feel to it. And thank you for the compliment! Are you kidding? I was delighted to see this review because I desperately want to love one of the Lubin’s in this style bottle! Give it a try! Maybe this is the one for you. Reading the description I thought I’d gotten this in a swap, but it turn out that’s Nuit de Longchamp. They sound very similar to me; green, seamless mossy chypres with a white floral element. I think I’ll wear it for my Forgotten Friday, actually. I barely remember Nuit de Longchamp (such a good pick for Forgotten Friday! ), but L de Lubin likely packs more lemon. I have samples of both (L and Nuit de), along with several more obviously masculine scents. I just really liked the originality of the Lubin stuff, plus they don’t seem the sort of perfumes that fade away in a couple of hours (he said, looking severely in the direction of Phaedon, Olfactive Studio and L’Artisan). I love it that they resurrected such classics, too! Gotta love those 70s chypres! Thanks for a great review, Angela.